Find out why business-critical applications are not performing at remote sites; resolve the root cause; and assure QoS. 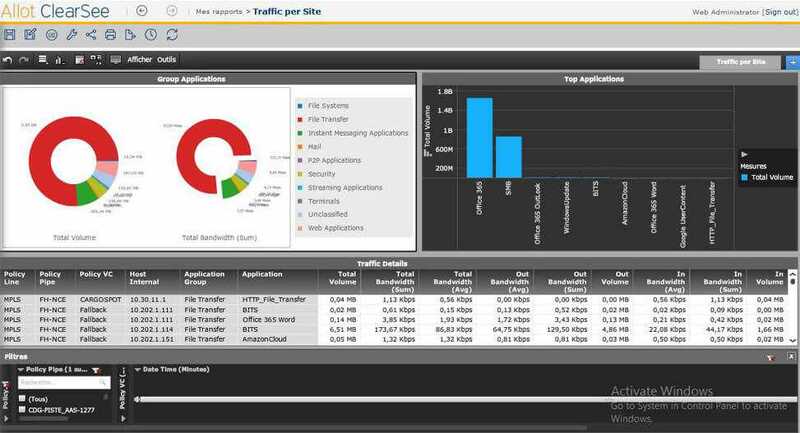 Use Allot Secure Service Gateway to gain granular visibility and control of resource utilization and application performance across the entire network. Leverage Allot SSG integration with MS Active Directory to govern user access to recreational Web content and other acceptable use policies. Since 1971, Worldwide Flight Services (WFS) has been growing its business into one of the world’s leading providers of ground handling services for airlines and airports, and today they serve more than 300 airlines and 195 airports on five continents. Their reputation has been built on assisting airlines and airports in growing their business based on the quality and reliability of WFS services and the expertise and professionalism of the WFS global team. Our case study focuses on WFS France which provides services through its offices located in Paris Charles De Gaulle, Orly and other French airports. On the WAN, a full 33% of the traffic was generated by remote endpoints synchronizing MS Windows and Office 365 files. Moreover, a quick drill down also pinpointed an old XP workstation not optimized for Office 365 downloads. VPN applications were being used to bypass the local proxy and hide recreational Internet activity. “When we looked at our network traffic through Allot’s visibility dashboards, it was eye-opening,” said Toufik Ouanaïm, IT France Manager and David Le Clei, Network Architecture at WFS. “For the first time ever, we got a truly accurate view of application and user behavior on our LAN, WAN and Internet links,” continued Toufik. Armed with fresh insight and Allot’s powerful policy toolset, WFS implemented QoS policy that assures critical application performance and user Quality of Experience across their entire network. Top priority and guaranteed minimum bandwidth are allocated to Cargo Application and Office 365 Outlook to accelerate and assure application delivery even when WAN links to CDG become congested. Lower priority and rate-limiting are applied to SMB File Sharing and anti-virus updates so these downloads can carry on the in the background without hogging available bandwidth. Top priority and guaranteed minimum bandwidth are allocated to Cargo Application and Office 365 Outlook to accelerate and assure application delivery even when WAN links to CDG become congested. Lower priority and rate-limiting are applied to SMB File Sharing and anti-virus updates so these downloads can carry on the in the background without hogging available bandwidth. Using Allot’s simple policy editor, WFS are able to define and refine a hierarchical traffic management policy that matches application performance and QoE to their business priorities:? Level 1: QoS policy per WAN and Internet link? Level 2: QoS policy per remote office for WAN and Internet traffic? Level 3: Application prioritization per remote office.WFS also activated DDoS Protection and Bot Containment in their Allot Secure Service Gateway platforms to protect firewalls and routers from inbound and outbound flooding attacks and to contain the activity of bot-infected hosts on the network. WFS have also freed up Internet bandwidth capacity and minimized productivity distractions in the workplace by replacing their open-source web filtering solution with Allot’s proxy secure web gateway. Allot’s full support for MS Active Directory enables seamless integration with the company’s domain controller, allowing WFS to implement content filtering per user or user-group. And of course, Allot’s proxy secure web gateway protects all users from malware threats. WFS is now able to see and control critical Cargo Application and Office 365 performance for each of the service sites. By prioritizing business critical applications and rate-limiting others, WFS reduced bandwidth from 10 Mbps to 6 Mbps on one of their busiest WAN links, saving significant costs. This success will be duplicated on all WAN links. Ability to enforce Acceptable Use Policy per user profile lets WFS reduce recreational Internet use and other productivity distractions without over-blocking. Improved network efficiency and application performance helps WFS meet customer expectations for service safety, security and punctuality. Quickly identify and fix problems from a central console, before they impact business productivity and service quality. No need for remote site visits to capture data for analysis. With Allot Secure Service Gateway deployed in each of their datacenters, Worldwide Flight Services are able to align network and application performance to their business priorities and to meet or exceed the service levels they promise to deliver to internal operations and to customers, and on which they stake their reputation. Allot’s accurate monitoring and control allows WFS to analyze traffic across their entire network – remote sites and datacenter – and to control bandwidth consumption and performance on every link. The same Allot SSG platform also guarantees a high level of network security which is critical to their operations and to their customers.